One of the most incredible things about black holes is how much bigger they are than almost anything else out there. Now, a new image taken at the Atacama Large Millimeter/submillimeter Array (ALMA) Observatory shows that we’ve been totally wrong about how they manage to grow so large. An international research team looking at black holes with ALMA snagged this photo of a super-massive black hole, 300 million times the size of our sun, right in the middle of a giant meal. The rare photo shows the black hole in the process of swallowing three huge clouds of cold gas—each one with more material than a million suns and moving at speeds of 800,000 miles per hour. Black holes were previously thought to feed solely on a slow, steady diet of hot gases that surround them. That’s still believed to be the main way that black holes feed themselves. But somehow black holes manage to attain sizes that are much bigger than that method would suggest. So researchers came up with a second, odd theory. On rare occasions, black holes go into a feeding frenzy, where they swallow up huge amounts of giant, cold clouds of gas. Up until now, that was simply one of several theories about how black holes manage to get so big. But this photographic evidence seems to show that it’s a real phenomenon. Still, the question of how common it is remains. This feeding frenzy most likely only happens under very specific weather conditions—like the ones present when the photo was snapped. 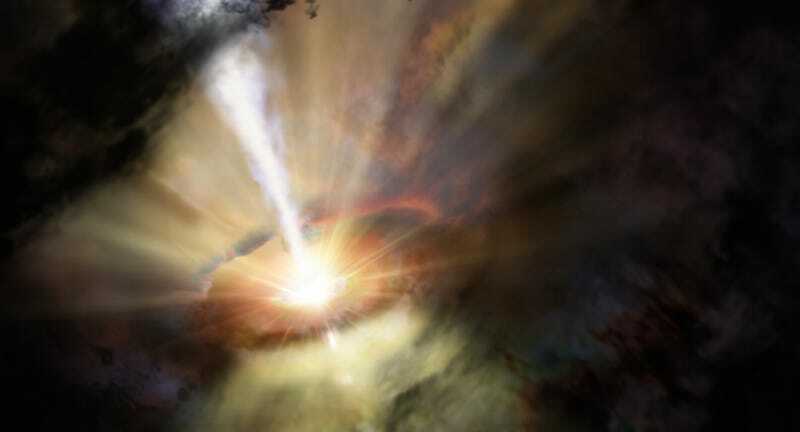 So far, only those three giant clouds of cold gas have actually been seen feeding a black hole. Still, researchers believe there could be as many as thousands of similar clouds around this particular black hole alone, ready to be devoured when the time is right.